Pulse HR is an advanced activity tracker that enables you to effortlessly keep track of daily activity and training sessions. Includes continuous heart rate to help you get the most out of your workouts, connected GPS to map your route, and automatic sleep tracking with a daily Sleep Score. Plus, you can stay connected to what matters with fully customizable smartphone notifications. Crafted with a premium 316L stainless steel case and a reinforced polycarbonate surface coating, Pulse HR features a minimalist style that can stand up to the rigors of everyday life. Pulse HR outlasts the competition with a long-life battery of up to 20 days so you can spend more time moving, and less time charging. Pulse HR lets you learn about yourself to help you get in shape. Why should you measure your heart rate every day? Improving your health on a day-to-day basis is about taking care of your most important muscle. Strengthening your heart can be an an excellent way to build endurance, and knowing your heart rate zones can help you improve. Walk, run, swim: all daily activities are automatically recorded to give you the best overview of your health and daily activity goals in the Health Mate app can help you get inspired to make progress every day. Discover how Pulse HR can help you improve your physical activity. Every activity is different: you don’t work out the same way when you’re playing soccer or doing yoga. If you want to track your training session as accurately as possible, simply hold down the side button to select from more than 30 activities. This will start your session and activate continuous heart rate so you can optimize your training. Retrace your route. The connected GPS feature, which you can access via your smartphone, will give you a map of your session, including distance, altitude, and pace. This function requires a Bluetooth connection with a smartphone, and location services must be turned on. Measurements are automatically synced to the Health Mate app, which means you can visualize results with easy-to-read charts. Includes the time spent in each heart rate zone (light, moderate, intense, and peak) to help you to focus your workouts and achieve real results. And with automatic recognition 24/7, all your daily moves will be recorded in the app. Knowing your nights can help you improve your days. Each morning, Pulse HR will provide updates on your night's sleep (light & deep sleep plus interruptions) in the Health Mate app. And with Smart Wake-Up, the band features a silent vibrating alarm that can wake you at the optimal time in your sleep cycle to help get your day off to the best possible start. The length of your night's sleep isn't always a guarantee of quality. See your Sleep Score in the app when you wake up and get the lowdown on the factors that influence the quality of your rest, so you can improve it. Stay up-to-date with what matters while living in the moment. Whether you want to see calls, texts, events, or your favorite apps, you can enjoy the freedom that comes with not having to take your phone out of your pocket. Pulse HR automatically synchronizes via Bluetooth with the free Health Mate app, available for iOS and Android. See your health data, view your progress, receive personalized advice, and get extra motivation to reach your goals. 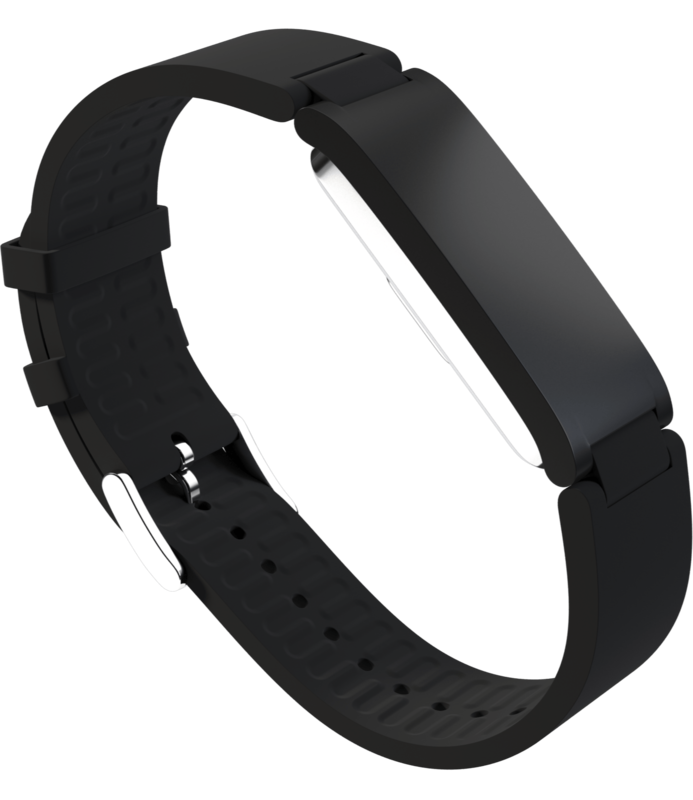 Silicone wristband: fits wrists up to 200mm / 7.9"
Turn on Pulse HR screen by raising your wrist or pressing the side button. Tap the screen or press the side button to scroll through the data—date, heart rate, steps, distance, calories burned, and alarm time. Tap the screen or press the side button to browse through the Pulse HR features. Launch workout mode with a long press on the side button, click through to find your activity and long press again to select. Starting workout mode will activate the connected GPS feature when running.